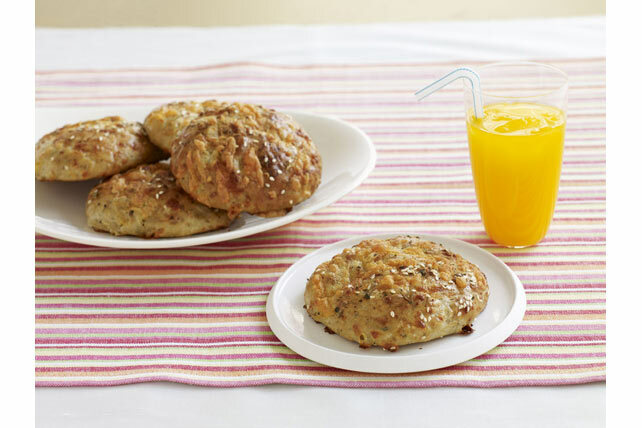 KRAFT Shredded Cheese and a blend of seasonings add irresistible flavour to these warm buns. Microwave milk in small microwaveable bowl on MEDIUM 45 sec. or until milk is warmed. Stir in honey and yeast. Place in warm place; let stand 15 min. or until doubled in volume. Meanwhile, combine flour, salt and 1-3/4 cups cheese in large bowl. Mix seasonings. Reserve 1 tsp. seasoning mixture; mix remaining with flour mixture until well blended. Add yeast mixture, butter and 2 eggs; knead gently 5 min. or until mixture forms soft dough. (Dough will be sticky.) Cover with damp towel. Place in warm place; let rise 1 hour or until doubled in volume. Divide dough into 12 pieces; roll each into smooth ball. Place, 2 inches apart, on parchment-covered baking sheet; cover loosely with damp towel. Let rise 1 hour or until doubled in size. Heat oven to 375ºF. Beat remaining egg; brush onto dough. Sprinkle with remaining seasoning mixture, remaining cheese and sesame seed. Bake 25 min. or until golden brown. Place the dough in your oven or microwave oven to rise. (Be sure the oven is not turned on.) For best results, cover the dough with a moist cotton, non-terry cloth towel during the rising times. Spread 1 Tbsp. Desi Dressing onto cut sides of each bun; fill with sliced smoked chicken, 1 lettuce leaf and 1 tomato slice.